Summer Breeze House is a delightful 4 bedroom detached modern house with hot tub, Wi-Fi and amazing outdoor space with grass areas, terraces and patio with hot tub. This delightful house has fabulous far reaching sea and country views, sleeps 8 comfortably and has the benefit of a huge south facing deck and garden area which is a real sun trap. With 2 car parking spaces and just a 5 minute walk to the village centre and a 10 minute walk to the beach and sand dunes this holiday home is just perfect for a family holiday. New beds, mattresses, bedding, bed linen, towels and kitchen equipment for 2018 season. Also new patio furniture for the 2018 season and outdoor improvements. A few steps up to the front door and then the hallway offers a place to leave coats and shoes. Understairs cupboard has ironing board, high chair etc. This is a reverse level house to make the most of the views from upstairs and therefore the bedrooms are on the ground floor. Each bedroom is tastefully themed on a coastal theme. The master bedroom has a super-king (6ft) bed, dressing table and large window cupboard. Wall art hangers provided if you wish to hang a few outfits as there is no room for a wardrobe. The double bedroom has chest of drawers, bedside units and window to the back of the house. The king-size bedroom has a large chest of drawers, dressing table and facility for hanging a few clothes. The bunk bedroom has 3ft adult size sturdy bunks, a window to the front and is ideal as a children's room. Please note that there are no wardrobes due to offering good sized beds but the owner has thoughtfully provided some kind of hanging hooks on the walls in order to allow guests to hang a few items. See photo images for more detail. On this level is the family bathroom which has a white suite with shower over bath and vanity unit. Upstairs is the kitchen and living areas. There is a shower room with double size shower, WC and basin. The good size kitchen has white units, full size dishwasher, washer/ dryer, microwave, electric oven and hob, and fridge freezer. The main open plan living room is divided into dining room with 8 seater table and the living room with 2 new tan leather comfortable sofas and brand new chesterfield style fabric 2 seater sitting neatly in the window. Patio doors lead onto a south facing patio and garden. This delightful sunny patio consists of a new hot tub area with two large relaxing outdoor rattan effect lounging sofas, separate Al-Fresco dining area, with large stone BBQ (charcoal not supplied) and concrete dining table for 8 people. Steps lead to a gorgeous large sunny south facing decking area with swing bench, a lovely place to sit taking in the adjacent countryside views. This is also a lovely spot to sunbathe on the loungers provided with far reaching views over Croyde village to Downend, the sand dunes and Croyde beach and sea beyond in the distance. 2 large secure storage areas for surf boards, bikes or kayaks and an outdoor cold shower to rinse off after a day at the beach. Beach life facilities at their very best! Saturday changeover. Towels provided at an extra charge. Bath and hand towel bundle £6.00. Please indicate on the booking form when booking whether or not you wish to pay the extra to have the towel bundles. High chair provided, no cot. A £200 security deposit will be pre-authorised and then released again after the holiday. 2 private off road parking spaces. The number of people staying at this property, as per our Booking Conditions, must not exceed 8 plus baby. No smoking or vaping in the house. 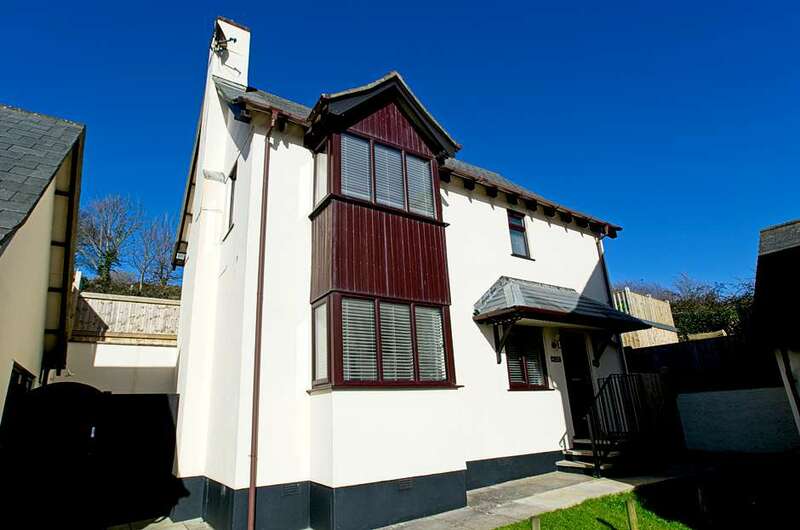 Holiday Home Hunter are delighted to be able to offer our first holiday home in Croyde which we feel will be a truly popular family holiday home with added features like the hot tub, bike and board storage, outdoor cold shower and sunny decked outdoor area. Don’t delay, book today! !